The goal of my work is to understand the formation and evolution of cosmic dust, particularly where it is formed. I work on space dust in supernovae, in M31, in nearby galaxies and over recent cosmic time. This has involved using the European Space Agency’s Herschel Space Observatory with funding from STFC and the European Research Council. I am involved with analyzing data from the Herschel Space Observatory as part of programs such as Mass loss from Evolved StarS, The Herschel Reference Survey and Herschel-ATLAS. I was awarded an ERC Consolidator grant in 2015. See a short video about my work (credit Spectrecom Films). I obtained my first degree from Cardiff University in 2001 and stayed on to do my PhD with Prof Mike Edmunds and Prof Steve Eales, awarded in 2004. I obtained a fellowship with the Royal Commission for the Exhibition of 1851 to carry out post-doctoral research during 2004-2005. I then was hired here at Cardiff as a lecturer and was made a Senior Lecturer in July 2013 and was awarded a Personal Chair in Astrophysics in 2015. Runner up for the Cavendish medal (most outstanding piece of research and R and D by a younger researcher in the UK) at the SET for Britain event in the House of Commons 2005. I have been invited to present my research at Buckingham Palace. I am a fellow of the Royal Commission of the Exhibition of 1851 and Higher Education Academy and part of the WISE in Wales Committee, a campaign which collaborates with industrial and academic partners to encourage UK girls to pursue STEM or construction related courses/careers (I have also been a part of the Role Model series). Organiser of scientific conferences for the Royal Astronomical Society, see review report here and co-Organiser Lifecycle of Dust 2013 in Taiwan including editor of the conference proceedings. Matuura, M.et al. 2017. ALMA observations of molecules in Supernova 1987A. Presented at: SN 1987A, 30 years later – Cosmic Rays and Nuclei from Supernovae and their aftermaths: IAU Symposium 331, Saint Gilles-Les-Bains, La Reunion Island, France, 20-24 Fenruary 2017Proceedings IAU Symposium. Gomez, H. 2013. Dust in supernova remnants. Presented at: The Life Cycle of Dust in the Universe: Observations, Theory, and Laboratory Experiments, Taipei, Taiwan, 18-22 November 2013. Clark, C. J. R.et al. 2013. A blind survey of the local dusty universe with Herschel-ATLAS. Presented at: The Life Cycle of Dust in the Universe: Observations, Theory, and Laboratory Experiments, Taipei, Taiwan, 18-22 November 2013. pp. 1-4. Sacchi, N.et al. 2011. Herschel-SPIRE spectroscopy of nearby Seyfert galaxies. Presented at: 280th Symposium of the International Astronomical Union (IAU), Toledo, Spain, 30 May - 3 June 2011The Molecular Universe, Posters from the Proceedings of the 280th Symposium of the International Astronomical Union held in Toledo, Spain, May 30-June 3, 2011. NASA pp. 322. Ciesla, L.et al. 2010. 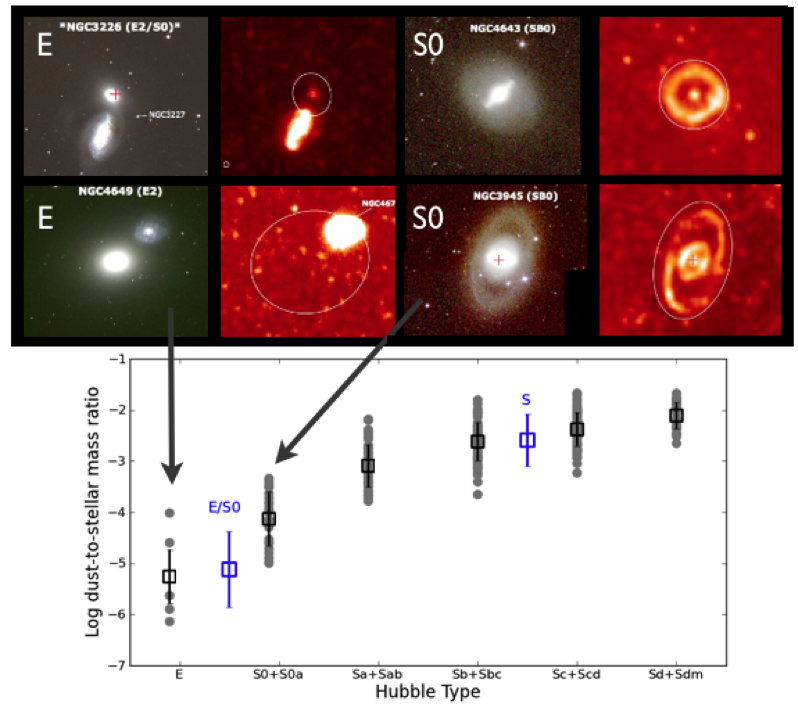 SED fitting of nearby galaxies in the Herschel Reference Survey. Presented at: SF2A-2010: Proceedings of the Annual meeting of the French Society of Astronomy and Astrophysics, Marseille, France. Rho, J.et al. 2010. A dust twin of Cas A: 21-micron dust feature in the Supernova remnant G54.1+0.3. Presented at: 38th Cospar Scientific Assembly, Bremen, Germany, 15-18 July 2010. Gomez, E. L., Gomez, H. L. and Yardley, J. 2009. Social networking: an astronomer's field guide. In: Simpson, R. J. and Ward-Thompson, D. eds. Astronomy: Networked Astronomy and the New Media (Cardiff, UK, 22-24 September 2008).. Bristol: Canopus Academic Publishing, pp. 175-185. Rho, J.et al. 2009. Dust formation observed in young supernova remnants with Spitzer. Presented at: Cosmic dust--near and far, Heidelberg, Germany, 8-12 September 2008 Presented at Henning, T., Grün, E. and Steinacker, J. eds.Cosmic dust — near and far. Proceedings of a conference held in Heidelberg, Germany, 8-12 September 2008, Vol. 414. ASP Conference Series San Francisco: Astromomical Society of the Pacific pp. 22-35. Galliano, F.et al. 2008. Dust evolution in low-metallicity environments: bridging the gap Between local universe and primordial galaxies. Presented at: Spitzer Proposal ID #50550. Edmunds, M. G. and Gomez, H. L. 2005. Dust in supernovae and supernova remnants. Presented at: The Fate of Most Massive Stars, Grand Teton National Park, WY, USA, 23-28 May 2004 Presented at Humphreys, R. and Stanek, K. Z. eds.The Fate of Most Massive Stars: Proceedings of a Meeting held at Jackson Lake Grand Lodge, Grand Teton National Park, Wyoming, USA, 23-28 May 2004. Astronomical Society of the Pacific conference series Vol. 332. San Francisco: Astronomical Society of the Pacific pp. 324-331. Morgan, H. L. 2004. Origin and evolution of dust. PhD Thesis, Cardiff University. I am a Fellow of the Higher Education Academy and have a Postgraduate teaching qualification. I have mentored other staff members through the Postgraduate diploma. I supervise and assess 3rd and 4th Year project students (~7-8 pa), and am academic tutor for 1st and 2nd years, personal tutor for years 1-4. Cosmic dust is a nuisance to astronomers as it blocks out optical light, affecting our view of the Universe. It is also very important as dust affects star formation, stellar mass loss rates, the formation of molecular hydrogen and planets. Our latest work suggests that supernovae or their progenitor stars may be responsible for polluting the interstellar medium with lots of dust. Previously it was thought that low mass stars, which take around a billion years to evolve, were the main contributor to the dust budget. This is especially important in the early Universe where fast-lived, massive stars would be the only source of dust. Figure: Herschel (red) and Hubble (blue) composite image of the Crab Nebula. Credit: ESA/Herschel/PACS/MESS Key Programme Supernova Remnant Team; NASA, ESA and Allison Loll/Jeff Hester (Arizona State University). Stars more than eight times heavier than the Sun are known to enrich galaxies with heavy elements. Near the end of their relatively short lives they eject material in intense winds, sometimes with speeds up to 4 million mph. The enigmatic star eta Carinae is thought to have lost over 80 times the mass of our Sun in the last 1,000 years in the form of gas and dust (Gomez et al 2006, 2010). Supernovae and their remnants may also be important at polluting galaxies with lots of dust and could be an important place for forming molecules but this is still a controversial topic. As part of a guaranteed time programme with Herschel, we searched for the tell-tale light shone by dust grains in the historical galactic supernova remnants: Cas A, Tycho, Kepler and the Crab Nebula (above Figure). This led to the discovery of a new cool dust component in the core-collapse SNe Cassiopeia A (about 30,000 Earth’s worth of dust) led by Mike Barlow (Barlow et al 2010). 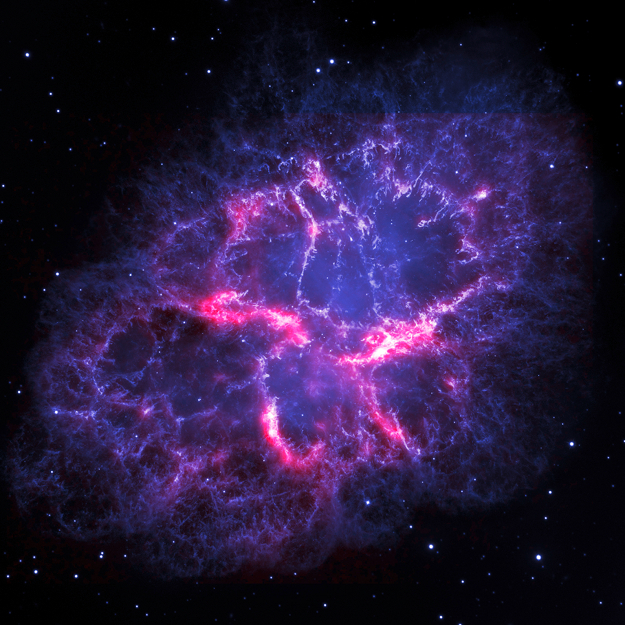 We investigated dust in the Crab Nebula which lies about six and a half thousand light years away from Earth and is the remnant of a supernova originally seen by Chinese Astronomers in 1054 AD. Starting out at 12-15 times more massive than the Sun, all that was left after the dramatic death of the star is a tiny, rapidly rotating neutron star and a complex network of ejected stellar material. The Crab Nebula is well known for its intricate nature, with beautiful filamentary structures seen at visible wavelengths. Now, for the first time, astronomers can see exquisite filaments of dust shining in the far-infrared region of the electromagnetic spectrum. After ruling out other sources of light in the infrared spectrum, we used Herschel to see great detail in the the far-infrared, and found filaments are made of cosmic dust. This provides definitive evidence that the Crab Nebula is an efficient “dust factory”, containing enough dust to make around 30,000-40,000 planet Earths. Unlike in Cas A, the dust may be made of mostly carbon materials, crucial for the formation of planetary systems like our own Solar System. In many supernova remnants, most of any dust freshly-formed is destroyed as it ploughs into the surrounding gas and dust, crushed by the violent shock waves. A final treat is that the Crab Nebula is a much kinder environment for dust grains, so the dust does not seem to be destroyed (see also Gall et al 2014, Gomez et al 2014). This may be the first observed case of dust being freshly “baked” in a supernova and surviving its outward journey carried along by the shock wave. We also saw huge quantities of dust in the Cassiopeia A supernova remnant (Dunne et al 2003, Dunne et al 2009, Barlow et al 2010, De Looze et al 2017) and in G54.1+0.3 (Rho et al 2017 submitted, see also Temim et al 2017). We also published the first comprehensive study of dust formation in the ejecta of Type Ia supernova remnants (Gomez et al 2003, Gomez et al 2009, Gomez et al 2012a). A Type Ia supernova originates from the thermonuclear explosion of a low mass star (a white dwarf star) in a binary system with another star. These are the very objects used to probe huge distances as they act like a beacon in the distant Universe – they are extremely bright (so we see them far away) but they are also useful as all Ia explosions are thought to have the same intrinsic energy when they explode. For this reason, Ia explosions were used in a recent study in 1998 which found that that further away supernovae were dimmer than they should be, hence the idea of a mysterious force pushing everything further away from each other than we expected – i.e. dark energy. This study won the Nobel Prize for Physics in 2011 so these astrophysical objects are very important to understand, and the presence of dust around these objects could affect these results. We found no evidence for significant dust formation in Type Ia supernovae (Figure 2) which places stringent constraints on the environments in which dust and molecules can form, and also in the contribution of these exploding binary systems to the dust budget in galaxies. This is a relief to studies which hope that distant Ia sources are not being “dimmed” by their own dust shells. Figure adapted from Smith et al 2012. Ellipticals, so called due to their elliptical-like appearance in visible light, are often described as “red and dead” galaxies, where stars are no longer forming and all the dust has been used up. The elliptical galaxies we see today, are thought to be the descendants of the massively dusty, active star forming galaxies seen in the very early Universe; these galaxies are forming stars thousands of times faster than our own and are likely harbouring an active galactic nucleus at their centre. Astronomers are not really sure how these massive systems form, particularly whether or not they are formed by merging galaxies together from collisions. An important question to address is whether or not environment affects the formation and evolution of these systems. Other questions we want to ask is “are ellipticals really devoid of dust?” and, “what can we learn about their history using any dusty features we can see?”. Well it turns out alot! Our group has worked on the Herschel Reference Survey (a sample of 323 galaxies observed by Herschel in the local universe led by Steve Eales and Alessandro Boselli, Boselli et al. 2010). Working with then PhD student Matt Smith, we showed that dust emission is detected in roughly half of the sample of 62 early types and ellipticals (Smith et al. 2012). These galaxies are therefore not all “red and dead” as often described in the literature. Interestingly, we found that Herschel is the most sensitive way to detect the interstellar medium in these galaxies, suggesting we may be able to use dust as a tracer of gas instead of the traditional carbon monoxide and atomic hydrogen lines. The results from Herschel (see also Rowlands et al. 2012) indicate that traditional so-called “quiescent” galaxies can still have significant dust emission, star formation and interstellar material. However, if we compare the dust masses of the early types with spiral galaxies from the HRS, we find an order of magnitude decline in the dust-per-unit stellar mass as we move across the Hubble sequence of galaxies from spirals, to S0s to ellipticals. The high dust masses, the similar gas-to-dust ratios to spirals and the lack of correlation between starlight and dust, all point towards an external origin for the dust in ellipticals, i.e. the interstellar medium is accreted via tidal accretion or interaction with a nearby galaxy. Compare the starlight from the two galaxies M86 and NGC4438 (optical, top) and the dust seen by Herschel (coloured map bottom). Overlaid on this map is the shock-heated hydrogen (red), this is evidence that the dust in M86 has been stripped from NGC4438. Our Herschel results towards the centre of the Virgo Cluster (the nearest group of galaxies to us) revealed the debris from galaxies interacting with each other. Take a look at the optical image of the galaxies in the Virgo cluster (top panel). The brightest galaxy in this image is the giant elliptical M86. We can also see the spiral galaxy NGC4438 on the left, with a smaller galaxy nearby (Gomez et al 2010). In the Herschel submillimetre image however (bottom panel), the elliptical galaxy is now the faintest galaxy (this is because it must have used all its dust up in forming stars). In this galaxy, we also see something quite unusual, the dust is offset from the centre and appears to be distributed in a very different way to the stars (seen in the optical image). If we now compare the dust to hot hydrogen gas (which shows gas being pulled out of the galaxy due to the interaction with the spiral galaxy in the top right) we see a pretty good match between the cold dust seen by Herschel and the hot gas trailing between the two galaxies. The dust appears to be following the ionised hydrogen trailing out of M86 and is being pulled towards the galaxy in the top left. This is really strong evidence that the dense environment which M86 is in significantly affects the dust and metals in galaxies, the data points to more than a million Sun’s worth of dust being stripped from this source in a “displaced interstellar medium”. I also co-supervise Subhajit Sarkar (main supervisor Enzo Pascale) on exoplanet research and Nikki Zabel (Supervisor: Tim Davis). PhD students Chris Clark and Simon Schofield successfully defended their PhD in Dec 2014 and Dec 2016 respectively.